This is “Montréal-style” event where participants can use either French or English. Video message from Pavel Richter, CEO, Open Knowledge International. 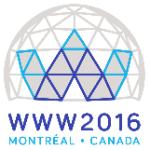 Brief address from Jim Hendler, of the organizing committee of the WWW2016. (Documenting the commons with open linked data). 10:00 Open-Ouvert : Federal Open Government Initiatives | Initiatives fédérales relatives au gouvernement ouvert | Allison O’Beirne – Canada, Treasury Board Secretariat. 11:45 Message from Diane Mercier, Ambassador of the Open Knowledge Foundation in Canada. 12:00 Community lunch in the lounge. The Open Knowledge Festival of Montreal aims to strengthen networking among open communities in the region of Montreal and in Quebec – practitioners, researchers and interested citizens. It provides a showcase of initiatives that enables discoveries and a feedback area.